Finland’s THE PSYCHO SEASON have released a bit of an enigma with their album “Grunge River”, which is out now via Inverse Records. “Grunge River” is comprised of different genres of music which is what makes it a mystery. 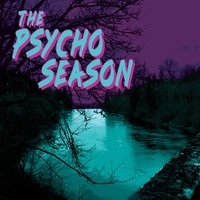 THE PSYCHO SEASON summon up a nice musical buffet that is sure to be appreciated. The album title is a bit misleading as well. While there are grunge elements, there are also other elements such as metal and alt rock vibes. Starting off “Grunge River” is “Don’t Know About Tomorrow”, a grunge filled tune that brings Alice in Chains to mind, but also The Tea Party. “You Are the Sun” is very similar to the opening song. There are more driving and crunchy guitars however. Jukka Ruottinen’s vocals are varied indeed. At times he brings almost a Beastmilk-like (now Grave Pleasures) vibe to the music. Album stand out “Overcome” brings all the aforementioned genres into play. There are metal vibes and 80’s rock like The Cult. All mixed in with a grunge attitude. Easily the most diverse and kickass song on the album. However, here is where I got a bit confused, because THE PYSCHO SEASON decided to place a cover of Alice in Chain’s “We Die Young” in the middle of the album. Great cover by the way, just a bit out of place. “Slide” could have benefited from being a bit shorter. There were times that it did become a bit repetitive. However, the song is very solid just lingers on a bit more than it should. “Drown” is a fantastic song with its thick and chunky riffs. It is also stand out song and deserves many listens. “One with the Stars” is just an overall great tune. Grimy at first but gets bright with the chorus. Probably has the most modern sound on the album. The energy gets kicked up a notch with “Sky in Smoke”. Has more energy than most of the songs and comes at the right time. The obvious Alice in Chains influence becomes abundantly clear throughout the album, but more specifically with closer “Hangin’ On”. Driving and crunchy guitars are the main event here. Also, great contrast between both guitarists. This was a great way to end the album. Overall, THE PSYCHO SEASON have conjured up a solid album that has much diversity. “Grunge River” is not only grunge, it is metal, it is 80’s, and a dash of psychedelic (really). This is very much a case of multiple influences seeping into the music and it works very well, because fusing these styles of music usually do not work. For fans of grunge, alternative rock, Alice in Chains, The Tea Party, and Beastmilk. Let’s see what the future holds for THE PSYCHO SEASON!